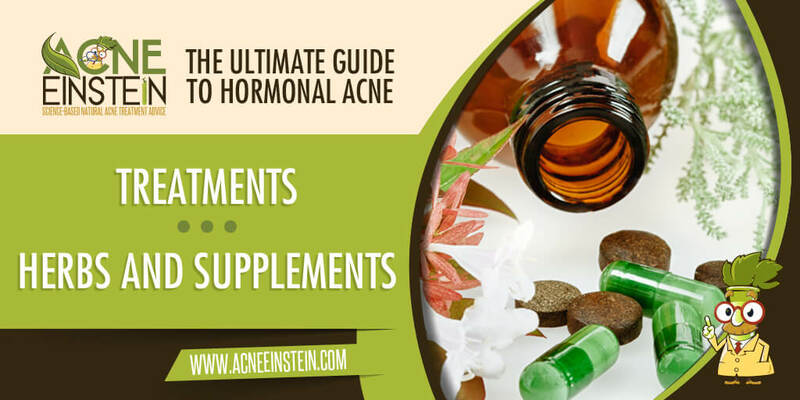 Certain herbs and supplements can balance hormones and reduce acne. This article covers scientific evidence for herbs and supplements commonly used for acne. Several herbs and supplements might be helpful in hormonal acne. Like pharmaceuticals, the most promising ones either improve the estrogen/androgen balance or reduce insulin levels. With its well-known effects to reduce PMS symptoms, Vitex is one of the most promising options. Cinnamon and vinegar, with their ability to reduce blood sugar and insulin levels, could also be helpful. In contrast, saw palmetto probably has no effect on acne while Ashwagandha could even cause acne by boosting DHEAS levels. Vitex, or chasteberry, has long been used to balance female hormones, treat PMS symptoms and support female fertility. In natural health circles, it’s also touted as a treatment for female hormonal acne. In 2012, Dr. Diana van Die and colleagues reviewed all the studies on the effect of Vitex on PSM symptoms. 7 out of the 8 reviewed studies showed supplementing with Vitex leads to a significant reduction in PMS symptoms. The studies also showed Vitex to be safe. In general, Vitex didn’t cause any more side effects than placebo pills. While there’s no doubt that Vitex can reduce PMS symptoms, it’s not clear whether it can also reduce acne. In 1967, German researchers tested Vitex on acne patients. Unfortunately, the paper is not available online, but the title of the paper reads “Improvement of acne vulgaris following therapy with agnus castus”, which would suggest the treatment was effective. Vitex seems to reduce the levels of hormone prolactin, which, when the levels are too high, reduces estrogen levels in women and can cause menstrual problems. This suggest that Vitex could also be helpful in acne – at least in women with high prolactin levels. Symptom of high prolactin levels in women include decrease in menstruation or complete lack of periods, loss of libido, breast pain and vaginal dryness. There's good evidence to show Vitex reduces PMS symptoms and could also be helpful in acne. Recommended for women who have acne and PMS, irregular periods or other such symptoms. The most common dosage in the studies was 40 mg/day. Popular Vitex supplements on Amazon. Although some studies with cinnamon did not show any effects, the majority of studies performed did consistently show beneficial effects of cinnamon on multiple parameters, especially decreasing fasting and postprandial glucose levels and improving insulin sensitivity. On the other hand, the two studies that have tested cinnamon on women with PCOS show far less impressive results. One showed improvements in insulin resistance but not on testosterone levels. The other showed improvement in menstrual cycles but no change in insulin resistance or testosterone levels. It’s plausible that taking cinnamon supplements could help acne. Studies have yielded mildly positive results, but it could very well turn out that cinnamon has no effect on acne. The only way to know for sure whether it helps your acne is to try it. Maybe. May or may not help with acne, but cinnamon is delicious, and that's a good enough reason to have some. Apple cider vinegar (AVC) is another home remedy touted for hormonal acne. Acetic acid, the main acid in all vinegars, reduces gastric emptying – meaning that food comes out of the stomach at a slower rate. This reduces glycemic index of carbohydrates and lowers insulin levels. A small study from 2013 showed daily ingestion of vinegar is helpful in PCOS. In the study, the women took 1 tablespoon of apple vinegar daily for 90 days. Insulin levels dropped slightly and abnormally long menstrual cycle shortened somewhat. Ingesting the vinegar had no effect on testosterone levels. All and all, these are mildly positive results. But it bears to keep in mind that this was a very small study, only 7 participants, and small studies are prone to false positive results. A 2014 review of vinegar on blood sugar metabolism goes over several studies. In short, taking a tablespoon of vinegar before a high carbohydrate meal can reduce blood sugar and insulin levels anywhere from 10 to 30%. But it seems vinegar has little to no effect when taken with a low GI, high fibre meal. That makes sense as the glucose is absorbed more slowly to begin with. Another study showed that taking 2 tablespoons of ACV before bed reduced blood sugar levels the next morning. TIP: Take a tablespoon of vinegar with high carbohydrate meals and 2 tablespoons before going to bed to reduce blood sugar and insulin levels. Anecdotally, many people report that ACV reduced their acne. Research shows it’s at least plausible this is true. However, I should point out that taking any form of vinegar should give you the same results as there’s acetic acid in all vinegars. Despite the hype, there’s nothing particularly miraculous about apple cider vinegar. Maybe. I don't expect ACV to really help with acne, but, on the other hand, there's little harm in trying it. Doctors in southwestern Turkey were puzzled with large numbers of men complained about low libido. Eventually, they figured out that the daily consumption of four cups of spearmint tea common in the region was to blame. Spearmint is known for its anti-androgenic properties, and thus can be helpful for women struggling with hormonal acne. Two studies have tested the androgen blocking effects of spearmint in women. A study from 2007 showed that two cups of spearmint tea for five days reduced free testosterone levels by 29% and increased estrogen levels by 36%. Another study from 2010 showed a similar reduction in testosterone levels on women who drank two cups of spearmint tea for 30 days. In this study, another group of women drank similar amount of chamomile tea, and there was no change in hormone levels in this group. Spearmint tea had no effect on DHEAS levels in either of the studies. Spearmint could be helpful for women with hormonal acne. Try taking cups of spearmint tea a day. Given its androgen-blocking properties, men should not take spearmint. Good value spearmint teas from Amazon. Saw palmetto is a small palm growing mainly in the South-Eastern United States. It’s extract is fatty acids and phytosterols thought to have androgen blocking properties. The extract is used to treat benign prostate tumors, urinary tract problems and hair loss in men. Due to its claimed androgen blocking properties, it’s also touted as a cure for acne. Dr. Leonard Marks and colleagues tested the androgen blocking ability of saw palmetto in men with benign prostate problems. Their results showed that saw palmetto slightly reduced DHT levels in the prostate but had no effect on blood testosterone or DHT levels. In contrast, Finasteride (a prescription DHT blocker) reduced blood DHT levels by 70%. This study shows saw palmetto acts as a mild androgen blocker – at least in men. However, as we discussed on the page about prescription medicines, I don’t expect systemic (drugs, supplements) DHT blockers to improve acne. A review by the National Institute of Health showed that rigorous studies show saw palmetto extract has no effect on problems in the prostate and the urinary tract. University of Maryland Health Center page about saw palmetto states that it may also block estrogen and thus interfere with birth control pills. If true, this means taking saw palmetto could aggravate the androgen/estrogen imbalance in women and worsen acne. Given that rigorous studies show saw palmetto doesn’t affect DHT levels, and the potential concerns about estrogen blocking, I can’t recommend saw palmetto for acne. And even if saw palmetto would block DHT, oral (drugs, supplements) DHT blockers probably aren’t useful in acne. Saw palmetto seems to have little effect on androgens and likely won't reduce acne. It may even aggravate acne by reducing estrogen levels. Ashwagandha is a medicinal herb with a long history in the traditional Indian medicine (Ayurveda). It’s classified as an “adaptogen” meaning it helps body to return to balance, or homeostasis, after physical or psychological stress. Given the role of stress in acne, Ashwagandha could be helpful. There’s also some evidence to show the herb reduces blood sugar levels. Dr. Choudhary and colleagues showed that 8 week treatment with 300 mg of Ashwagandha reduced stress and cortisol levels and boosted happiness in chronically stressed individuals. It remains to be seen whether the stress-lowering effect of Ashwagandha is good or bad for acne. Another study showed that while Ashwagandha lowered stress and cortisol levels it also boosted DHEAS levels. DHEA and DHEAS hormones are known to help the body to deal with stress, and perhaps Ashwagandha reduces stress and cortisol by boosting DHEAS. Given the central role DHEAS plays in hormonal acne, I would be careful with Ashwagandha supplements. Two small studies showed Ashwagandha reduces blood sugar levels in humans (source, source). Unfortunately, neither measured the effect on insulin levels. Both studies were very small (less than 10 participants), and I would take these results with a grain of salt. Depends. Ashwagandha may reduce stress and anxiety acne causes - but keep in mind that it does that by boosting DHEAS levels - a hormone known to cause acne. If you do try Ashwagandha, keep this in mind and pay attention to your skin.